View More In Toy Banks. Hey man, nice ride! 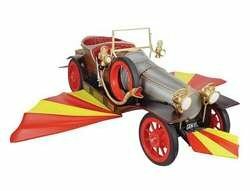 From the Classic 1968 fantasy musical Chitty Chitty Bang Bang, comes this detailed replica of the title car, which derives its odd name from its unique motor sounds. Measuring 14-inches in length, this replica features real rubber tires, removable wings, and special electroplating! Packaged in a window display box, this great item brings a classic vehicle from a classic movie to life. If you have any questions about this product by Stevenson Entertainment, contact us by completing and submitting the form below. If you are looking for a specif part number, please include it with your message.